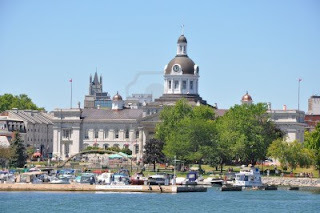 In August 2013 I had the privilege of flying to Kingston, Ontario for a week to visit with my daughter. I grew up in a small town and do not have fond memories, so was interested to see what this city with a stated population in 2011 of under 124,000, had to offer. Just one note - I only spent a week here, so cannot comment on what it would be like to live here. 1. 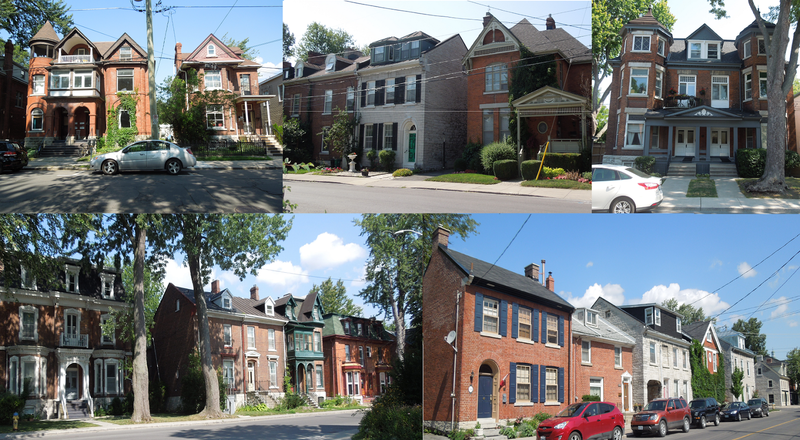 Architecture - The first thing that drew my eye was the architecture as the downtown area is filled with historic buildings from the 1800's that are still in use. 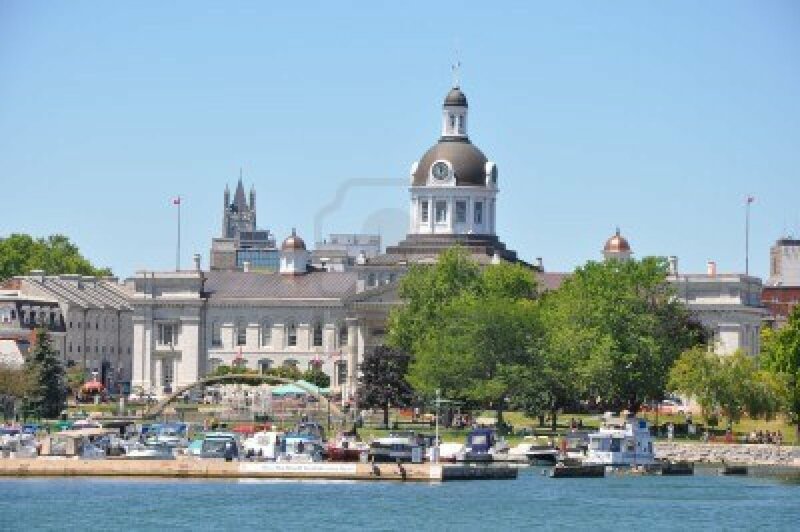 Kingston was the original capital of Canada before it moved away from the border to Ottawa. At the time it was felt being so close to the United States would make it open to invasion from our southern neighbors. The streets are lined with a mix of styles in brick, limestone and a chunky grey stone. With no earthquake threat, these more durable building materials took centre stage. There are just a few wooden homes. As you get closer to Queens University, these homes are split into numerous student housing units. I spent a full 2 hours one day roaming by myself totally entranced. walk through the historic downtown area lead by an actor with a guitar who dressed and spoke as an Irish immigrant living in Sir John A. Macdonald's time. The tour covered the background of several of the more interesting building and 3 times our guide broke into song. The most impressive was one he performed while walking backwards down the street The most hilarious, a rap song sung near the end with Irish accent to folk guitar music. Like I said - kitschy and fun, but also full of facts. Money tight? There are several free walking tours with online information and audio download. 3. Waterfront - At the waterfront across from the former capital building is a small park where vendors set up stands. Most involve food, but there was a caricature artist there working every day - Dino. What fun! Danielle and I had one done of the two of us in black/white (preferred it to the colour version which looked more cartoony) and it is one of my cherished souvenirs. Kingston also offers a long pathway for bicyclers, walkers, skaters and more to use that hugs the lake. There are small sections you have to hit the road, but most is separated. There were always people walking it every morning when I arose. 4. Restaurants - With both Queens University and the Royal Military College in residence, the downtown area has more restaurants than any city I have visited. 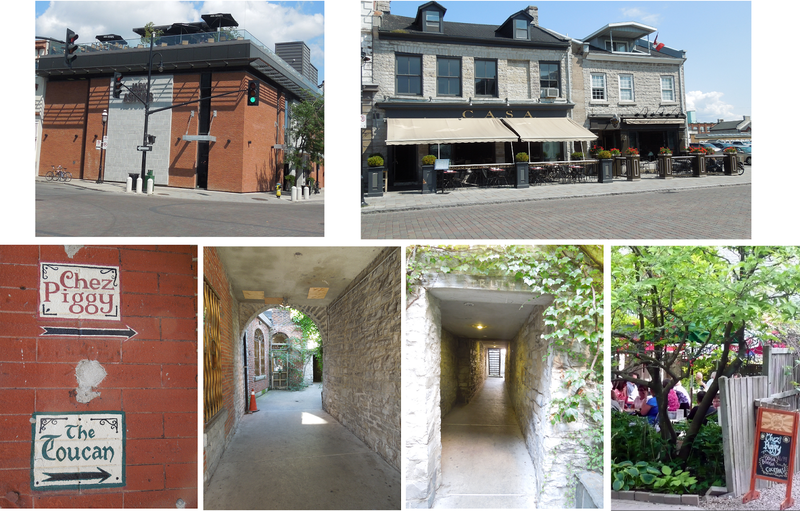 Patios abound - from rooftop, to sidewalk, to secluded courtyards. Patio hopping is a regular weekend pasttime. Some of the great restaurants we ate at include: Olivea (fresh local bread with specialty olive oil and vinegar, pastas, salads, a Monday night Mojita special and Tuesday night live jazz), Pan Chancho Bakery (provides fresh bread to many restaurants and also has a great patio with appetizing menu onsite), Chez Piggy (higher end, great food, a cool entry way through 2 arched brick walkways and courtyard patio), Kingston Brewing Company (great beer selection, a large single malt scotch list, funky bar atmosphere decorated with tons of old antique items and delicious baked wings), Woodenheads Gourmet Pizza (the most unique selection of fabulous thin crust pizza I have ever encountered), Sleepless Goat Cafe (fair trade coffee, funky atmosphere, unique menu and unusual ice tea blends like strawberry kiwi), Red House (small menu with a modern edge, comfortable atmosphere) and for a light dessert - Mia Gelato. It has over 30 amazing flavours (I think) and even with the small serving size you could try 2 selections. Top - rooftop and street front patios, bottom entrance and courtyard patio for Chez Piggy. 5. Earth to Spirit Fair Trades Arts and Crafts Gallery - My daughter pointed out this store late one day after closing hours and I knew I had to go back. It was full of beautiful ethnic art, pottery and more - much of it from Africa. When I managed to finally visit, I was overwhelmed by the pottery in particular as well as the large animal sculptures. As this was at the end of the trip, finances were limited so I settled for a pair of hand painted earrings created from bottle caps. They assured me that they would have an online store ready soon and that I could purchase anything long distance to be shipped. I took several photos of my favourite items. Time to work out a budget! 6. The Kingston Olive Oil company came to my attention as they provided the extra virgin olive oil and aged basalmic vinegar to the Olivea Restaurant. In store they also offer gourmet coarse salts. Their selection is unbelievable and the steampunk like pouring spouts they sell are out of this world. If you are intrigued by an oil or vinegar, they will help you pair it and offer recipe suggestions - Lemongrass Mint White Balsamic with Toasted Sesame Oil on Pasta or Peach White Balsamic with Organic Basil Olive Oil which I used to make an amazing salad dressing. 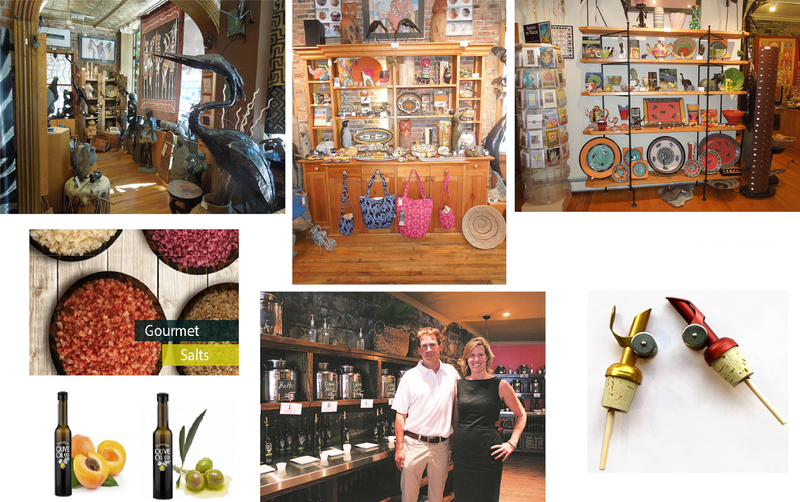 The website also offers pairing and recipes including drinks with olive oil or vinegar (yes you heard me - drinks). 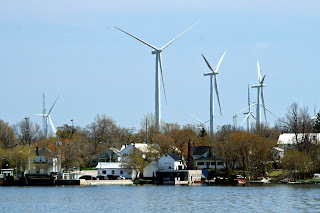 t. Prince Edward County - This day trip took me out into the lush countryside. I originally thought we were heading to an island as we had to take a small ferry over. Turns out there is a very small attachment to the mainland, but you couldn't escape that island feel. There were several small, quaint towns full of old heritage-style homes, unique shops and cafes, tons of green farmland, wineries, music festivals and more. Our first stop was the Huff Estates Winery where tastings are 2 for $1. Our favourites that day were the Pinot Gris and the 2011 Sculpture Series Riesling Reserve. At the same location was the Oena Gallery. The focus here is modern art and offered is a mix of painting, sculpture and ceramics. After a walk through the gallery, there is an interesting outdoor sculpture garden to peruse. On recommendation, we chose to have lunch at the East and Main Cafe in Wellington and couldn't have been happier - lush patio, great atmosphere, first-rate service and a really fresh, interesting menu. Next came a walk around Picton's downtown core exploring small shops - favourites include Books & Company and the attached Miss Lily's Cafe (coffee bar, menu, baked goods, candies and gift items) where we snagged a couple lattes and an assortment of bite-size flavoured fudge nougats. Our final stop of the day was Lake on the Mountain. Okay - it's just a hill by our West Coast standards, but those who live there supposedly call those in the valley Flatlanders! 8. Wolf Island - Another day trip - this time across the bay to a true island. The ferry leaves from downtown and in summer the line-ups are long, so don't be surprised if you have to wait for the next ferry. 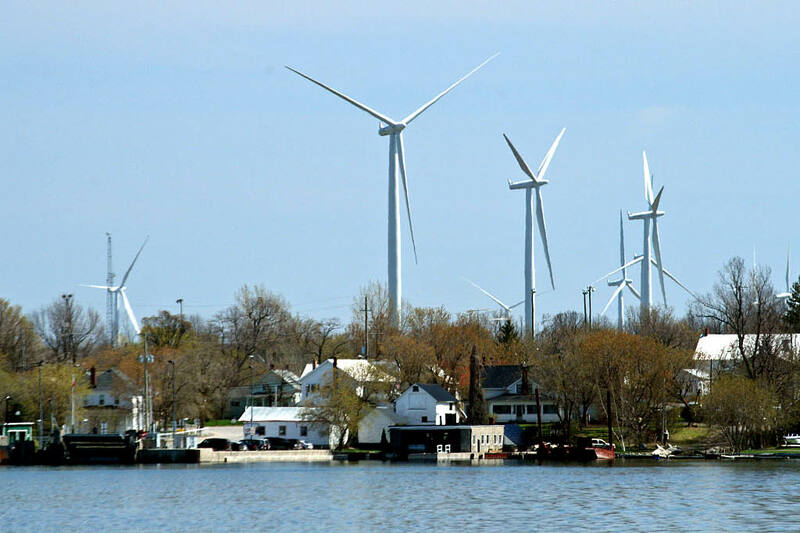 It catches your eye from the mainland because of the controversial Wind Farm consisting of 86 wind turbines spread across its landscape. There is a small community of residents , but it looked like pretty limited services (many walk-ons head right over to the Wolf Island Grill to enjoy lunch, hopefully on the outside patio facing the water, then head back). If you want to explore, you will need a car or, for the more adventurous, a bicycle. The island boasts a lot of scenic roads to explore and it certainly was popular with riders the day we went. Our destination was Big Sandy Bay for a walk on the beach and an unobstructed view of ocean-size Lake Ontario. In Kingston there are islands that obscure the horizon and you forget how really large this lake is until you get an unimpeded view with no land in sight. - Wind seems to be a regular visitor here, so sailboats, Ski-doo's, kite boarders and more could be seen out on the bay most days. - The area also offers a huge number of music festivals as well as some local theatre. For the big shows you still have to go to Toronto or Ottawa. - 3 days a week in the summer there is a farmer's market behind the capital building. My favourite vendor offered kits to make your own cheese - mozzarella, farmers or chevre! - I truly missed the wonderfully diverse cultural landscape we have here in Vancouver. I think when students return in September, that will change things up a bit. - When I did venture out through the suburbs a couple of times I was surprised that, despite the warm weather and beautiful sunshine, no one was outside - no kids playing in the streets, no one walking a dog. It felt a bit deserted and lonely. - The next was shared by my daughter. She enjoys living in Kingston, but noted that many of the young people you meet are here for school. When they graduate, they move away to take jobs in other areas. Next stop for me will be Maui in the late fall, so be sure and check back.